Stroll along Wilson Walk or the American bank and see the glorious autumn colour of this maple-like sweet gum. 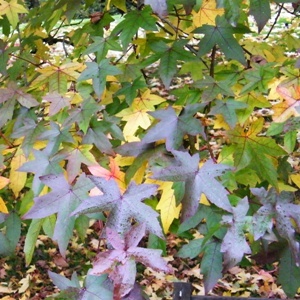 The magnificent star shaped leaves turn from rich glossy green, to brilliant red, purple, orange and yellow. A spectacular autumn colour display on one tree! Native to North East America and Central America Liquidambar styraciflua is a popular tree, with a relatively upright, conical habit, growing to 25m (80ft) tall. It is happy as part of woodland planting or makes an excellent specimen in the middle of a lawn.